"Surfacing," by artist Sandra Bilawich. Photo by Sue Frause. OK, that headline is a little misleading. Yes, you can go whale watching on Vancouver Island, but it will cost you (one of my favorite operators is the Prince of Whales in Victoria). But there's a different kind of whale watching happening in BC's capital city, and it's on dry land. Although I visit Victoria several times a year, this summer was the first time I noticed an eco sculpture on a corner near The Fairmont Empress. Titled Surfacing, it was created in 2010 by artist Sandra Bilawich of Elemental Designs in Vancouver, a joint venture of the City of Victoria and the Downtown Victoria Business Association. 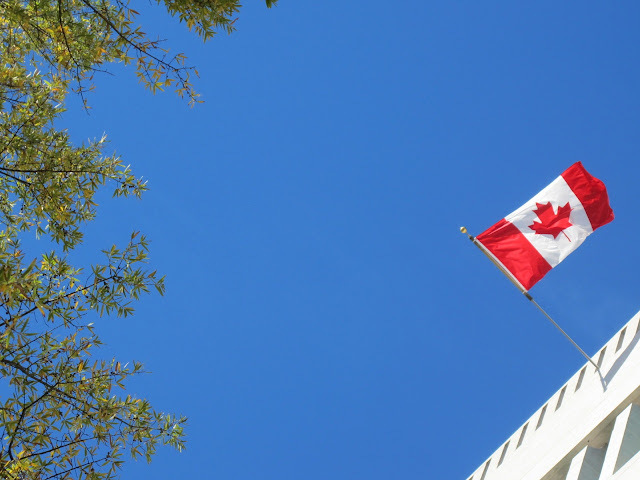 It's located at the southeast corner of Humboldt and Government Streets, across from Tourism Victoria's Visitor Centre. 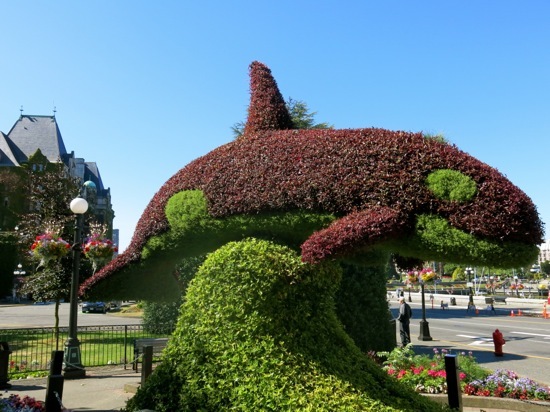 The sculpture features a mother and baby orca in the form of a three-dimensional horticultural display. Unfortunately, I took a picture of the side where the baby orca doesn't show (top photo), but you can see both the mother and baby below. Commonly referred to as The Orcas, it's 14 feet high and 21 feet long. 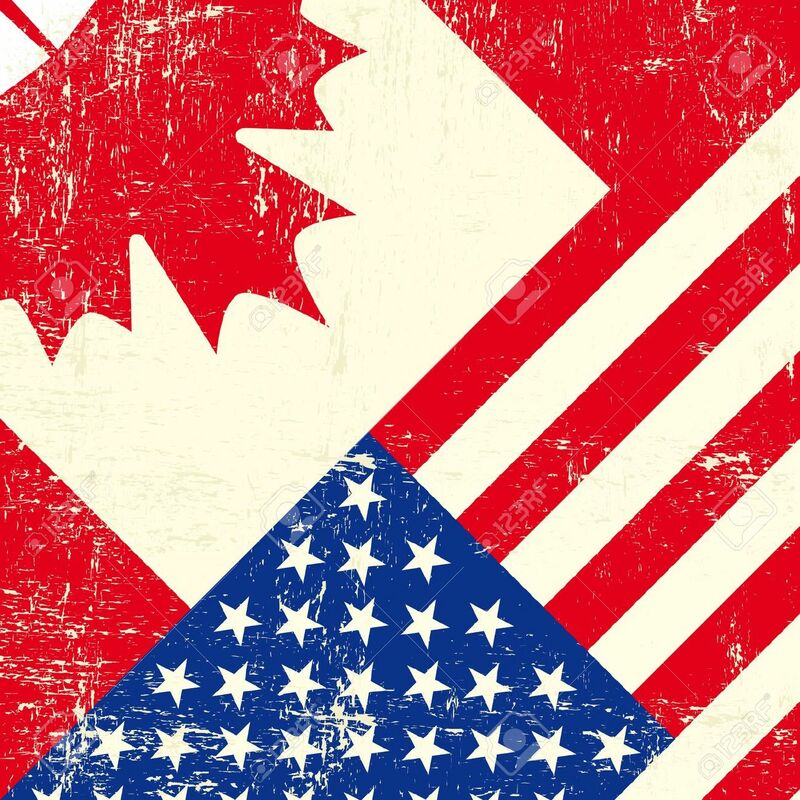 Or in Canuck talk, four metres tall and six metres long. 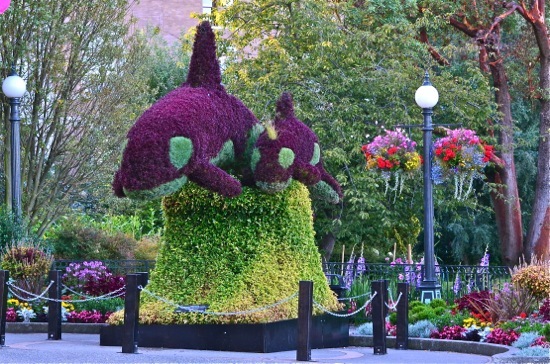 The garden display of a mother and baby orca riding a wave was inspired by similar three-dimensional garden structures in Burnaby, BC and Montreal's Mosaiculture Garden. The sculpture is re-installed in May every year and is a popular photo op for residents and visitors throughout the summer. In the fall, mom and baby orca return to their Beacon Hill Park nursery to spend the winter in a greenhouse. Surfacing by Sandra Bilawich. Photo courtesy City of Victoria. The project started in 2010 with two phases of construction: the design and manufacturing of the frame, and the preparation and planting of it as a three-dimensional garden bed. The frame took five months to build, utilizing steel in a grid-like fashion (the interior is hollow). The planting takes place over two weeks in February at the Beacon Hill Park nursery. That's when the frame is covered with a landscape fabric that's filled with 5.5 cubic metres of soil mixed with sand for drainage. Then 15,000 plants are added, including two varieties of Alternanthera and one variety of Santolina, annuals known for their colorful foliage and low maintenance. 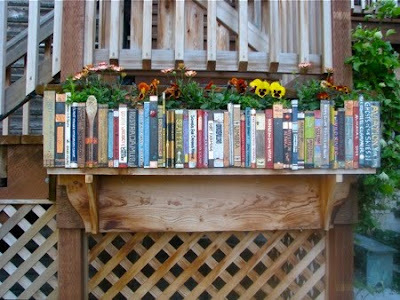 To maintain the display, the sculpture is trimmed bi-monthly and receives regular watering. Mother orca weighs 3,750 lbs. Baby orca weighs 1,050 lbs. Mother's dorsal fin weighs 80 lbs. Wave and base weigh 6,500 lbs. Total display weighs 11,380 lbs.